MOUNTAIN VIEW, CA, MARCH 15, 2018 – Atheer Inc., a leader in industrial enterprise augmented reality (AR) solutions, today announces a strategic partnership with Toshiba’s Client Solutions Division (CSD), a division of Toshiba America Information Systems, Inc., to make its flagship Atheer AiR™ Enterprise AR solution available to Windows 10 users for the first time on Toshiba’s just-announced dynaEdge™ AR Smart Glasses. 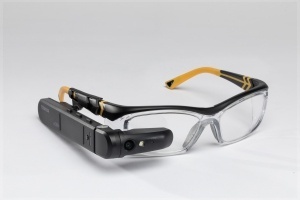 Using AiR Enterprise, the new Toshiba dynaEdge AR Smart Glasses offer an ideal solution for industrial applications such as field service, dealer service, manufacturing and repair operations, assembly line management, technician and expert training, warehouse picking, asset inspection and repair as well as remote visualization and support. Enterprise grade security: on-device, in-transit, and at-rest. Toshiba’s new dynaEdgeTM AR Smart Glasses packages together the company’s new dynaEdge AR100 Head Mounted Display (HMD) with its dynaEdge DE-100 Mobile Mini PC for a completely wearable PC system maximizing mobility, productivity and security. The implementation of AiR Enterprise for the Toshiba dynaEdge™ AR Smart Glasses marks the first time it has been offered natively on Windows 10, although Atheer has been providing users of Android-based smart glasses with industrial augmented reality solutions since 2012. Established in 2012, Atheer is setting the standard for AR in the enterprise. Our products are designed to improve the productivity, quality, accuracy, and safety of industrial workers. The award-winning Atheer AiR™ Enterprise solution provides “See What I See” video collaboration and taskflow management to empower the 21st century workforce in areas such as Automotive, Industrial, Logistics, Manufacturing, and Transportation. Powered by 46 issued patents - and validated with key customers including Masimo and Porsche Cars North America - the Atheer platform provides an out-of-box solution for enterprises. The company also recently announced that its AiR™ Experience technology is driving the AR interaction module and enterprise software support for the Flex Augmented Reality (AR) Reference Design introduced by Flex Ltd (NASDAQ: FLEX) for use by augmented reality hardware manufacturers around the world. Visit AtheerAiR.com or follow us on Twitter @AtheerAiR.